As the fourth version in Bob The Robber series, you will become a robbery break into areas with the safest security system, use your intelligence to move your character and avoid security cameras or patrol robots, Bob The Robber 4 is a fun arcade puzzle game with a nice graphics background that is fun to play. 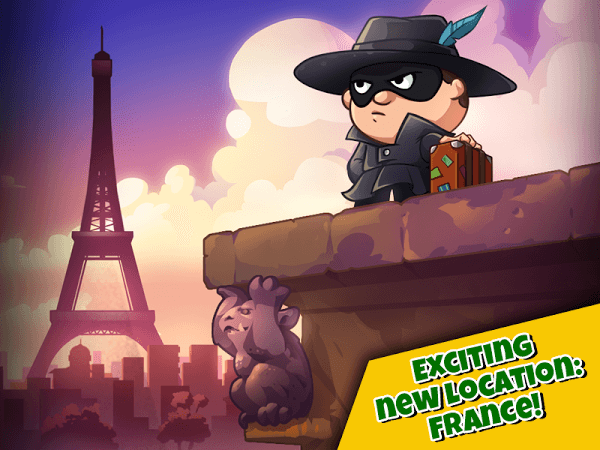 Right for the name “Double Trouble”, part 4 of that action game series talk about Bob: Robbery Bob will bring many exciting missions and more challenges than before. Compared to its previous version, Bob The Robber 4 for Android has eye-catching graphics, sharp graphics and much more powerful audio and visual effects. Especial, the game was integrated more than 60 fun levels and a variety of trophies to collect. So, don’t refuse that addiction game offline. Thanks to keeping the same view as the previous ones in Bob The Robber 4, you will easily view the entire game environment such as rooms, the location of items to collect, security staff stand, cameras, doors, exit. In addition, with 2 control buttons put on the left and right bottom corners so it’s convenience for gamers when playing on big screen devices. Help Bob plan a wedding for a robbery’s daughter, stop Thievious’s robbery plot and find out if the aliens really exist? More than 60 new levels with many places such as streets at Playa Mafioso Shamville or Seagull Bay. Keep the staff number but add a lot of new skills: Use the items to help Bob pass the hard mission. Customize the look of the character with many eye-catching costumes. Bob The Robber 4 MOD version without limits so you can buy the necessary equipment for yourself, you will not have to pay with your credit card to buy items in the game. However, if it’s too boring, try the original version on the Google Play apps store.